For meeting the diverse requirements of our customers, we manufacture, supply and export Full Body Top Opening Centrifuge. All the products are thoroughly checked by expert professionals on various parameters to ensure flawlessness. These products can also be customized as per the demands of customers. We also pack our Full Body Top Opening Centrifuge using quality material to assure safety during transit. The central flange of the machine is very thick and wide It is machined all over. The bottom flange is given a square groove to hold Teflon, PTFE, SILICON packing with required projection. The top flange sits truly on the packing making the joint 100% leak proof. Sufficient LBD LOCK allows quick and easy opening and closing. The body top is hinged to the base plate. The hydraulic cylinder opens and closes the top part of the body easily. The body top once opened, gives easy access to the entire basket in and out. The entire body from the inside and even the access to the central drive assembly is also made available. The basket if required can be removed when body top opens fully. Maintenance of the shaft and bearing housing can be easily done in top body opening machines. 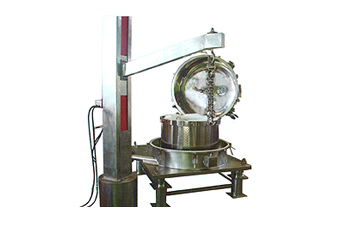 ACE INDUSTRIES is an engineering company which specialises in the design, manufacture and supply of BASKET TYPE CENTRIFUGE to industries like chemical and pharma for their many applications. We have an impressive track record working in this field for over three decades having supplied more than three thousand centrifuges (on turnkey basis all over the world) with exports to countries like the US, Italy, Thailand, Nigeria, South Africa, Philippines, Malaysia, Bahrain, Iraq, Iran among others.